Wildfires on Arctic tundra can contribute to widespread permafrost thaw much like blazes in forested areas, according to a study published in the most recent issue of the online journal Scientific Reports. 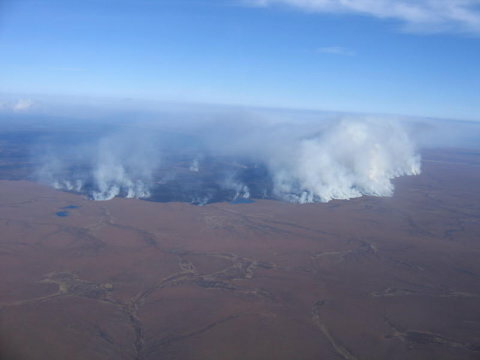 The project, led by the U.S. Geological Survey, examined the effects of the massive Anaktuvuk River fire, which burned roughly 1,000 square kilometers of tundra on Alaska’s North Slope in 2007. Using aerial data, researchers detected permafrost thaw in about a third of the fire’s footprint, compared to less than 1 percent in undisturbed areas. “Once you burn off that protective layer, what we observed is the effect isn’t immediate but takes a few years to really get going,” said Chris Arp, a study co-author and assistant professor at the University of Alaska Fairbanks Water and Environmental Research Center. The connection between wildfires and permafrost loss is better documented in boreal forests, where burns are relatively common. Tundra fires are less common, so their effects have not been studied as extensively. Using a laser mapping technique called lidar, researchers were able to document thawing during flyovers both two and seven years after the fire occurred. Researchers flew over the area repeatedly, using lidar to produce detailed topographic models of the burned area. Anchorage-based USGS research geographer Benjamin Jones led the project. They found that thermokarst, irregular topography such as slumping hillsides and surface depressions, was common in the fire zone. Arp said lidar was an invaluable resource. The data allowed researchers to measure changes in the land surface over time and predict how these changes will affect hydrology and vegetation within the Anaktuvuk River fire boundary, Arp said. Understanding conditions that cause permafrost thaw is important because the frozen soils and peatlands store significant amounts of carbon, the Scientific Reports study states. When permafrost thaws, the organic material in the soil decomposes and releases greenhouse gases, such as methane and carbon dioxide, which are considered factors in climate change. Arp said the changes are also notable because permafrost is the foundation of Arctic lands and ecosystems, both in the wilds and areas where roads and pipelines are built. Dramatic changes in permafrost, like the conditions observed following the Anaktuvuk River fire, will create new plant communities, change wildlife habitat and affect downstream waters, he said. Benjamin M. Jones, Guido Grosse, Christopher D. Arp, Eric Miller, Lin Liu, Daniel J. Hayes, Christopher F. Larsen. Recent Arctic tundra fire initiates widespread thermokarst development. Scientific Reports, 2015; 5: 15865 DOI: 10.1038/srep15865 and Science Daily.